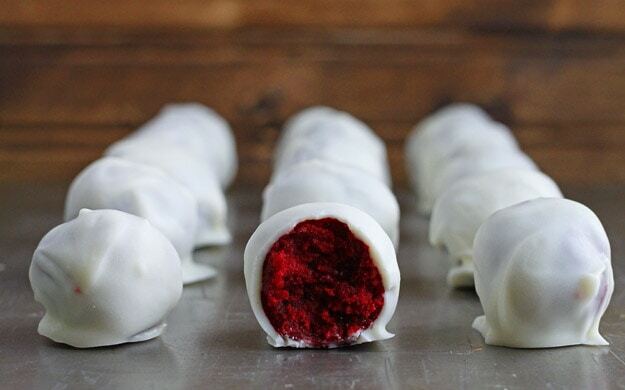 Red Velvet truffles with red velvet cake and cream cheese frosting in the filling, plus a white chocolate coating. These red velvet cake truffles are one of my favorite holiday food gifts to make! Have you ever made a cake truffle or a cake pop? It’s essentially cake, crumbled and mixed with frosting until it sticks together in a compact little ball. Then, after a quick chill session, the cake ball is dunked in a coating to make it pretty. I used the recipe for my small batch red velvet cupcakes to make these red velvet truffles, but I have a few notes about this. The recipe below is almost identical to the cupcakes, and uses 4 cupcakes to make a small batch of 10 truffles. However, you can easily double the recipe, bake it in a 6″ mini cake pan and get twice the cake truffles. When I’m making these red velvet truffles as gifts, I double the recipe. In my slightly expert opinion, I’ve found that 4 little cake truffles tucked into a small box is the perfect gifting size. The video for this recipe (either seen above or on the right side of the page) uses the 6″ cake pan method to make the cake for the truffles. Alternatively, you can make the cupcakes. Remember: 4 cupcakes makes TEN truffles; adapt the recipe accordingly. Regardless, we’re still crumbling lots of red velvet cake to make red velvet truffles! Here’s the best part: to bind the cake together, we use cream cheese frosting. So, we’re getting a bite of cake AND frosting at the same time! Now this is exactly why everyone loves cake truffles! The little cake bites are totally delicious on their own, but a little white chocolate coating never hurt anyone either. I use almond bark to coat these red velvet truffles, because I find it much easier to work with than white chocolate, but you know your own chocolate skills. Use the coating that you’re the most comfortable with. If your’e great at melting white chocolate without burning it (I am not), then use it! To play it safe, grab almond bark at the store–it’s much more forgiving. A fun twist on this recipe is bake one batch of the cupcakes using green food coloring instead of red. In each box, I put 2 green and 2 red velvet truffles. If you made this recipe and love it, please let me know in the comments section! Makes 10 truffles* The first part of this recipe is identical to my recipe for red velvet cupcakes for two. In a cupcake tin, place 4 cupcake liners on the outside edge. In a medium bowl, sift together the flour, baking soda, salt and cocoa powder. In another bowl, beat together the canola oil, sugar, buttermilk, egg white, red dye, vinegar, and vanilla using an electric mixer. Slowly add the dry ingredients to the wet ingredients, mixing all the while. Divide the batter between the four cupcake liners and bake at 350° for 20-22 minutes until a cake tester comes out clean. Let cool completely on a wire rack. When cool, crumble the cupcakes into crumbs. In a bowl, mix the softened cream cheese and powdered sugar. Add the crumbs and stir very well. Scoop a heaping tablespoon of the mixture into your hands and then roll into balls. Place the balls on a plate and refrigerate at least 4 hours. To make the coating, chop the almond bark into 1" chunks and place in a bowl. Heat on medium power in the microwave in 30-second intervals, stirring in between until melted. Dip each ball into the coating quickly, using a fork to turn, then let them dry on a piece of wax paper. Can be made 3 days ahead of time and stored in the fridge. *Recipe is easily doubled and baked in a 6" round cake pan. Candy, Chocolate Desserts for Two, Gluten Free, HEALTHY! These look great! So festive! I would so make red and green! Stunning photos – such great contrast! Yes yes and YES! I just made something so similar! I think I just found Christmas Eve dessert! Love this idea! I always like making cake pops/truffles, but hate how many most recipes make. This recipe is going to come in handy in my kitchen, for sure. These look beyond amazing! I’ve never had a red velvet truffle, yet I love red velvet. It’s a terrible life decision on my part, so I’ll change that by making these. They are ridiculously adorable too! oooooooh, green velvet truffles? Totally intrigued ;) These look crazy delicious! Well color me hungry. Red Velvet is a winner! Those look so delicious and Christmas-y! Oh, these are perfect! I’ll have to make these for myself and my husband soon! It’s really pretty, how striking these are. The red velvet against the white. Great looking truffles. Nice of you to experiment for us who might want larger batches. Oh, hi. Get in my face. Gorgeous! I would make this small batch and then eat them all myself! I love how vibrant these truffles look! looks incredibly mouthwatering and perfect for the holidays! Love it. that red velvet color is amazing! These are beauties. Perfect color for the holiday table! How pretty and festive! I love all things chocolate and love your idea of changing up red velvet to make it elegant and bite sized. Perfect treat to give away as gifts! Christina, I love your solution to the “towering 3-layer cake!” You are my hero. :) I wonder if this would work for Italian Cream Cake, too? These look outrageous, Christina! 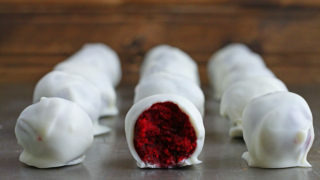 I love red velvet cake and would love it even more bite-sized. Beautiful little bites! Cute idea. Red velvet is always amazing! These are the perfect size for me! I sometimes crave something sweet, but not often, and I am very quickly satisfied after a bite or two. Just now catching up on my blogger posts from the past month and had to say that these look AMAZING!! Oh muh gawd, you are speaking right to my heart! Made these for my husband’s class last night. I made 30 of them. 5 people in the class no leftovers. These are amazing!! Thoes truffles look great! I wondered if they must be stored in the fridge? Thanks for a great recipe, I hope my boyfriend likes them! That pop of red is gorgeous!! Great recipe, I’m definitely trying this one out for the holidays! Quick question: I’m cheating since things are so crazy right now and I’m using a boxed red velvet cake mix. I know, I know, ????. I’d rather make them from scratch as well but I think this is the fastest and best way to make the quantity for my son’s class Christmas party for 22 students. The box makes about 24 cupcakes. Your recipe calls for 3 oz of cream cheese and a 1/2 cup of powdered sugar for 4 cupcakes. Do I need to figure this as 3 oz of cream cheese and a 1/2 cup of powdered sugar for every 4 cupcakes made? So this would be 18 oz of cream cheese and 3 cups of powdered sugar for 24 cupcakes? Please let me know. I would like to make them tonight or tomorrow so they are ready for Wednesday. Thank you! Good catch! I just re-watched and I’m shocked! I’ll have to ask my video guy if we cut that step for the sake of time. Instagram and Facebook limit the length of videos, and the egg and leavener might have just been cut for the sake of time. Crazy, right? Thanks for bringing this to my attention! In all cases, follow the written instructions within the posts. The written recipes are the most accurate. Ok, thank you for the response. No problem, I just wanted to make sure I follow the recipe to a TEE. :-). I will go by the written recipe. If I don’t have buttermilk, will whole milk work? So the typed recipe calls for 2 teaspoons cocoa powder which would be 4 teaspoons if doubled. In the video, it has 4 tablespoons of cocoa powder. Could you clarify if it is supposed to be 4 teaspoons or 4 tablespoons? Thank you! Also, does it matter when you put in the baking soda and egg white because I didn’t notice those in the video? These look so pretty and elegant. You mention putting 2 red and 2 green truffles in a box. Would you use a different recipe for the green ones (like mint?) or simply sub green food coloring for the red? I am so enjoying your site. Newly retired so can no longer bring my “extras” from my bake-scapades into the office. I use your recipes biweekly (at least!) Thank you! HOPE YOUR VIDEOGRAPHER GETS HIS/HER ACT TOGETHER FOR FUTURE VIDEOS BECAUSE I LOVED HAVING A VIDEO ALONG WITH A RECIPE. GIVE IT ANOTHER TRY! BTW, MADE YOUR SUGAR COOKIES THIS WEEK — ADDICTIVE! !